Fair Game on October 28, 2010. Liman is sharp and was open to discussing the political real-life story that his film took on and technical/creative aspects of production – specifically the cinematography and editing. In Fair Game, director Doug Liman and his script writers (Chez and John-Henry Butterworth) take on the architects of the war with Iraq and lay bare the facts of an American betrayal in their dramatic retelling of the experiences faced by CIA agent Valerie Plame (Naomi Watts) and her husband Joe Wilson (Sean Penn), the former United States ambassador to Niger. Fair Game is a classic “based on real events” story that works for all the right reasons. Hoping to find the missing ingredient to rationalize an invasion of Iraq following the September 11, 2001 attacks, the Bush Administration turned to Ambassador Joe Wilson, who faced down Saddam Hussein in a successful effort to evacuate Americans and other foreigners during the first Gulf war. This time the mission was to find evidence of uranium sales by the Nigerian government to Iraq – to prove that Saddam Hussein was still actively building weapons of mass destruction even though his nuclear capability was dismantled after the Kuwait conflict. This would be the smoking gun to complete the swagger of those in the highest level of power in the Bush administration. Wilson’s trip to Niger, a region he had great first-hand familiarity with, was the great hope of those who were already planning the next American war. Unfortunately for the administration it was a dead end. Even more unfortunate, though, was what happened next. Unwilling to accept the truth that there was no evidence of a nuclear program in Iraq the administration pushed it’s agenda forward. The battle between the Wilson’s and the Bush administration erupted and played out in the media and courtrooms for years, ebbing in and out of the national consciousness. Some day it might make a great documentary. Fair Game is a film about trying to hold onto family, trust and self-respect. Ms. Watts and Mr. Penn are utterly convincing as betrayed Americans who risk their lives and reputations to defend truth. By focusing the story on the life and possible death of an honorable American family, Liman has found the key to turning the events into an emotionally complex and politically suspenseful narrative. Liman knows how to tell a gripping story. His first film was the very low-budget Swingers, starring a very “fish out of water” Jon Favreau as a guy trying to make it in LA. With a chance to move up the Hollywood film chain he instead took on another low-budget project which he also both directed and shot. Go was a quirky youth-culture action film with an unusual structure, an original sense of style and – once again – outstanding performances by a mostly unknown cast. With his crack at a big budget Hollywood film he took on The Bourne Identity and found a way to take a fairly standard spy story and turn it into a nearly perfect popcorn-action-thriller. He has produced advertising for the political campaigns of Howard Dean and Barack Obama, and directed the violent and funny spy-spoof Mr. and Mrs. Smith, starring Angelina Jolie and Brad Pitt. All of which seems to have perfectly prepared him for telling the story of Valerie Plame and Joe Wilson. Fair Game is an international action film that dramatizes the war at home and the war over seas. The first third of the plot makes clear the breadth and depth of Plame’s undercover work for the CIA. Her role was a NOC, a non-official covert operative – which means she was on her own if caught spying. Liman, who shoots as well as directs, travels around the world – to Cairo, Amman and Kuala Lumpur – to show Plame’s undercover work and Joe Wilson’s attempts in Niger to discover the truth of the Uranium shipments. Shooting in a tight hand-held style there is a documentary sense to scenes involving former Iraqi scientists who are caught in the power struggle tearing the world apart around them. Liman’s camera follows to jailhouse meetings, spins and swirls in a car shot at while caught in a traffic jam, eavesdrops on a secret meeting in which Plame brings a terrorist sympathizer into the CIA fold, and scurries along the streets of Baghdad as a blackhawk helicopter swirls overhead. It is a dynamic style that suits the fighting overseas and the domestic battles that erupt at home. 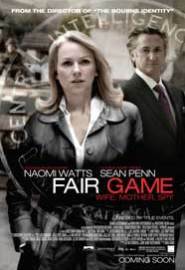 What makes Fair Game so entertaining is the tight well-crafted story and the incredibly rich and dynamic portrayal of the Wilsons by Watts and Penn. The story condenses more than three years of action into a lean 104 minutes – resulting in a clear and coherent narrative. The transformation of Plame and Wilson from American heroes to supposed traitors occurs within the context of marriage falling to pieces. The secrecy of Plame’s CIA missions brought a level of stress to the marriage in even the best of times – when the attacks on their characters were leaked to the press by Scooter Libby and Karl Rove, at the behest, most likely of the the President and Vice President, it seemed to break the spirit between them. Watts and Penn are superbly cast – she is elegant and secretive, seemingly able to handle anything that is asked of her. Penn plays Wilson as confident, brash, willing to take on the world for the sake of the truth. Sam Shepard makes the most a single scene as Mr. Plame, the father who finds a way rekindle Valerie’s spirit when she is at her lowest. David Andrews is virtually reptilian in a strong portrayal of Vice President Chief of Staff Scooter Libby and Ty Burrell is also effective and believable as Plame’s superior at the CIA. Fair Game puts the “Plame affair” into perspective using the best storytelling techniques – a tight plot, believable and realistic acting, brisk editing, and intimate hand-held camera work that unsparingly tracks the painful crisis experienced by Plame and Wilson. It’s an expert thriller that distills a shameful episode in American history into its most essential and coherent moments, leaving us with a powerful and dramatic dose of the truth. This entry was posted in Film Reviews and tagged Doug Liman, Fair Game, Joe Wilson, Naomi Watts, Sean Penn, Valerie Plame by Thomas W. Campbell. Bookmark the permalink.